We met Fiona Carter and her daughter Scarlet in a previous blog post when they kindly told us about their wonderful timeshare in Mallorca. The story did not end there however! 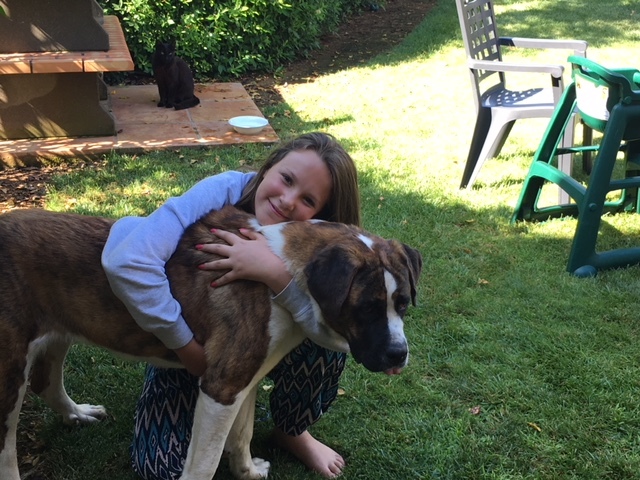 Scarlet had a whole other story to tell us that we are going to repeat here in her words – along with some advice from our legal members for other people faced with the dilemma of falling in love with an animal abroad. “The story of Zara began on the first night of a holiday in our villa at Son Antem in Mallorca. 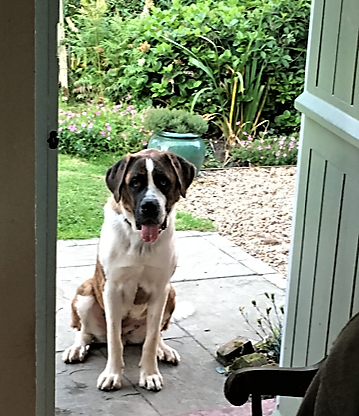 We know the Marriott very well – my mum bought two weeks in the resort before I was born so I have been coming here as long as I can remember and had never seen anything other than a cat on the resort, so the HUGE dog appearing in our garden was a total surprise. She was very shy at first, but I managed to stroke her and she then got much more confident with me. My mother and my cousin couldn’t get close to her, she was even scared of the bowl of water we offered to her. Whilst I kept her calm outside, my Mum rang reception to let them know there was a dog in the garden of the villa! 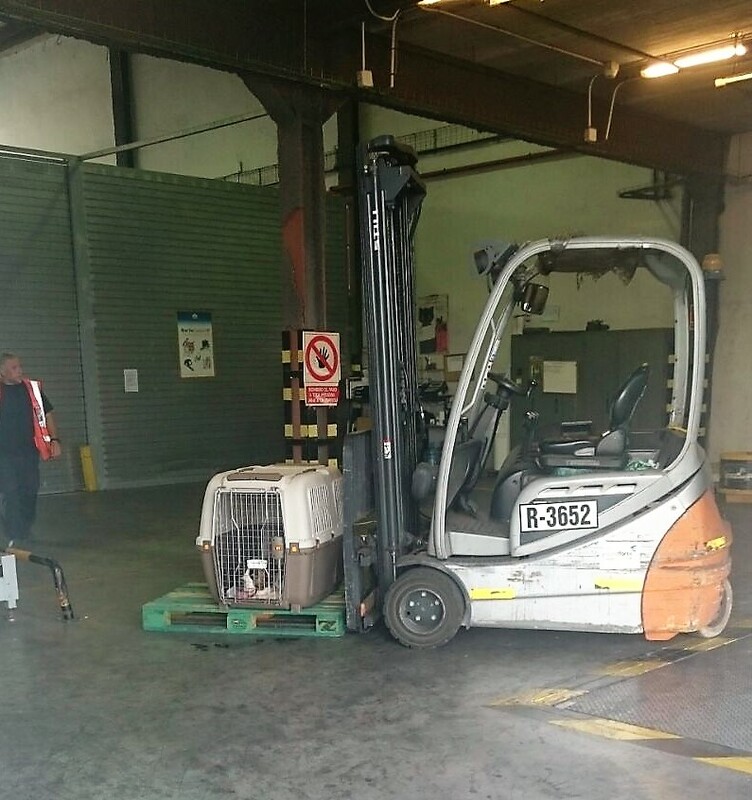 A man who worked for the Marriott turned up in a golf buggy to collect the dog and he seemed very shocked when he saw the size of her – there was no way she would have fitted! By then my mum had built some trust with her and she would allow herself to be stroked, but the man was much too scary for her. He brought chicken from the kitchen as we had mentioned she seemed very hungry, and she was. As we fed her, various phone calls were made and we were told that she had been roaming on the Marriott site for around two months. Eventually after around 45 minutes and another trip to the kitchens for more chicken, the dog rescue service arrived. They presented a lead and a collar but we could not catch the dog, and after many tries she ran off into the night. I thought that was the last time I would see the shy, gentle giant dog with the sad eyes. From that moment on, she followed us all around the resort, sat by the swimming pool and slept in the garden overnight. She would not come into the house and knew that the cats had to be avoided! On the Sunday afternoon however, her life changed and the local dog refuge came to collect her. She was very distressed and hated being caught but allowed us to drag her into the back of their van. We felt very, very guilty that she had trusted us but that we had tricked her into being captured. My mum kept reminding me that bringing her back to rainy England was out of the question. We had a dog and a pony already and my mum travels all over the place with work. 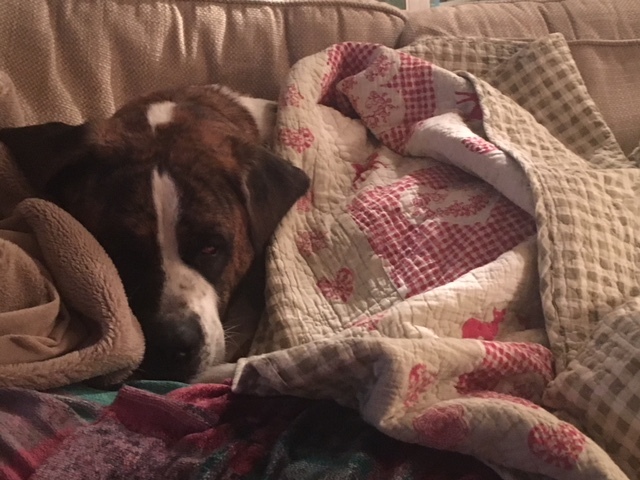 The next day, we went to the refuge to visit her and see how she had settled in – but as soon as we saw her we both knew that there was only one thing we could do for this beautiful, huge and young mountain dog. Bring her home! We returned to England and for 3 weeks, we communicated with the kind refuge owner who arranged visits from the vet and bought us a crate for Zara (as we were now calling her) to be transported in. We sent money over weekly to pay for her food and lodgings and helped with the other dogs too. Finally, the day of travel to the UK came but that was when all the problems began. It started with a 6am text saying that the airline would not accept the paperwork. My mum sent more email copies of the documents and we crossed all of our fingers. Finally they agreed that everything was ok and Zara would be allowed to fly – first step! Then another text came to say that the crate that the refuge owner had supplied was far too small and they were not prepared to let her be transported in it! We heard that the refuge owner had already left the airport and we were so upset as we didn’t know what we could do from England to help. But then we heard that actually she was on her way to her own home where her husband had an old chicken crate that was much bigger and he was going to travel back to Palma airport with it. It was nothing like the plastic, modern version but was much roomier for her and the airline were happy that it was suitable. Phew!..and so Zara was finally allowed to leave Mallorca! Nervously, we drove at 2pm on the same day to Gatwick to meet her but yet again we faced an issue. 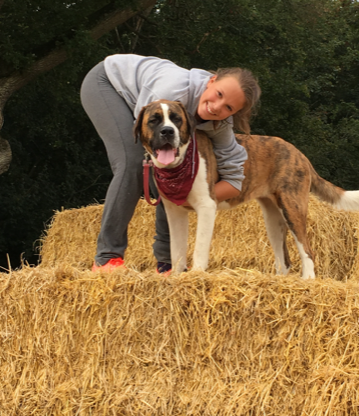 When we arrived we found that she would not be allowed past the border as the Spanish vet had not given her the right Tapeworm treatment for the British authorities! At this stage we had tears of sadness and frustration. It simply seemed that everything was against us. 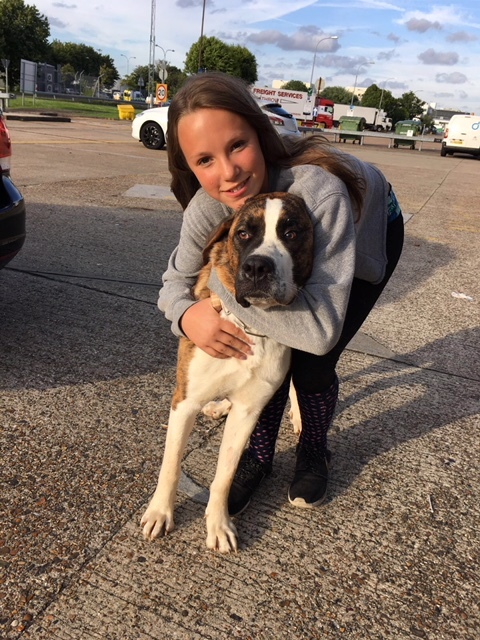 We were told that one option was to allow a vet to come and give her the treatment and after a 24 hour quarantine period at Gatwick she could be released. It was very expensive but they promised to stay with her all night and so we agreed. £440 later and finally we were given the all clear at 8pm the following evening to go and pick her up. She crept very cautiously out of the Animal Reception Centre and kept sitting down whenever she was too scared to walk any further. Our good friend Tom, Mummy and I managed to lift her into the boot of the car and she watched the M25 all the way home. 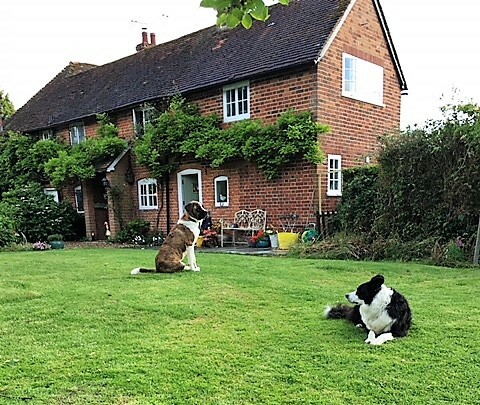 In the garden of our Hampshire cottage, she met Bertie the sheepdog and Max the springer spaniel. All was calm but she wouldn’t come in the house! As we ate dinner we put little bits of food on the floor of the kitchen and she crept, slowly but surely, and then in she came. Since that first night, she has slept soundly , so much so that she keeps us awake with her snoring! Zara is now a real member of the family and is discovering new things every day. An important part of her training is to behave in the village pub and now she is the most popular customer there – people are very moved by her story. So, our house is still too small, my mum does have to plan in advance for her care when she works away and our dog food bill has gone through the roof! But..Zara has brought something very special to our family. My Nanny suffered with Alzheimers and this gave us the idea to use Zara as a friend for the elderly in homes near here in Hampshire. We feel it is like her way of saying thank you to all the very many people who have been involved in rescuing her. You can’t help who you fall in love with, and though there are plenty of homeless dogs in the UK, sometimes circumstances are like those of Scarlet and Fiona and a dog chooses you. The process of adopting a dog from Spain is less complicated and cheaper now that quarantine laws have been changed. The reality however can still be fraught with issues as in the case above, but working with a refuge is key to a smooth transition. They will help you book your transport and arrange for adoption papers and the dogs passport. Below are some things to consider when planning on bringing a dog back to the UK. Be very sure you want to do this! It’s too often true that people get caught up in romance and rescue and make decisions they later regret. Consider carefully whether your dog will fit into your life, family, environment and whether you are prepared to give the time it takes to settle a dog that may have suffered cruelty and abuse. Also note that puppies cannot leave Spain until they are at least 15 weeks old. Vaccinations – Ensure your dog has had all the vaccinations necessary for entry into the UK. This includes tapeworm treatment and rabies, at which point your pet must also be microchipped, otherwise they will need to be vaccinated again. You must wait 21 days after the vaccination before your pet can travel. Cost – the average cost of adopting a dog from Spain is around 150 and 250 Euros for paperwork and vaccinations with a further 100 – 250 Euros for transport depending on the size of the dog (as it is worked out on weight like freight) and where it is travelling from/too. It is useful to have a contingency amount available also as in the case above things do not go as planned and you incur additional costs for vets bills etc.